Fronteraland was originally a temporary outdoor art installation on the grounds of the Bruns Ampitheater in Orinda, CA, created in response to California Shakespeare Theaters staging of Richard Montoyas play American Night in May/June 2013. Inspired by the raucous, witty, funhouse-esque qualities of the play, the Bruns grounds was reimagined as a quasi-amusement park/metaphor for the U.S. called Fronteraland. The park hosted a series of large hand-made signs advertising fictional rides and attractions related to factual American immigration and citizenship histories. The signs reference specific episodes in American history that affected those coming here or already here as natives, guests, residents, and citizens. As with a traditional amusement park sign, each Fronteraland sign advertises the thrilling conditions that an attraction has to offer, but also states, in small print, its limitations and conditions of exclusion. 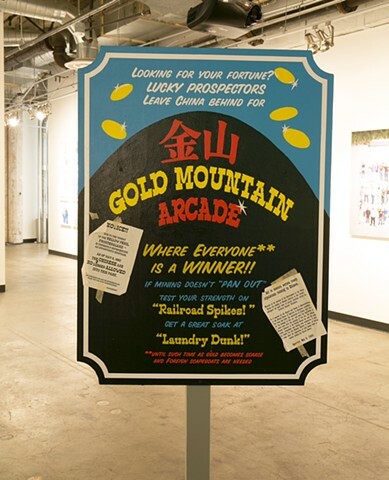 By playing on childhood memories of urgently wanting to be on a ride, and being either excited and terrified to be on it, or disappointed and excluded to not be allowed, Fronteraland supplemented American Night by actively and playfully engaging audience members in some more of the historic terms of exclusion from (or within) the U.S.
GOLD MOUNTAIN ARCADE Gold Mountain was the name given by the Chinese to western regions of North America, particularly California and British Columbia. After gold was first discovered in California in 1848, thousands of Chinese from Toisan in Guangdong began to travel to California in search of gold and riches during the California Gold Rush. During the early stages of the gold rush, when surface gold was plentiful, the Chinese were tolerated, if not well received. As gold became harder to find and competition increased, animosity toward the Chinese and other foreigners increased. After being forcibly driven from the mines, most Chinese settled in enclaves in cities, mainly San Francisco, and took up low-end wage labor such as restaurant and laundry work. They often ended up working in other menial labor such as railroads, factories, and farms. The Central Pacific Railroad hired 14,000 Chinese, 80% of its personnel, sometimes as strikebreakers. Chinese workers were paid $28 a month while whites received $60. By 1882, fear of the so-called Yellow Peril led to the Chinese Exclusion Act. Extremely limited immigration from China continued until the repeal of the Act in 1943.